Enteric neurons and glia are derived from a common pool of Sox10-expressing progenitors. (A and B) Short-term cultures of dissociated gut from E16.5 Sox10::Cre;R26ReYFP transgenic embryos immunostained for YFP (green) and (in red) either the glial marker BFABP (A) or the neuronal marker TuJ1 (B). (C and D) Whole mount preparations of MS-MPs from P30 animals of the same genotype immunostained for YFP (green) and (in red) either the glial marker S100β (C) or the neuronal marker HuC/D (D). Arrows indicate double-positive cells. 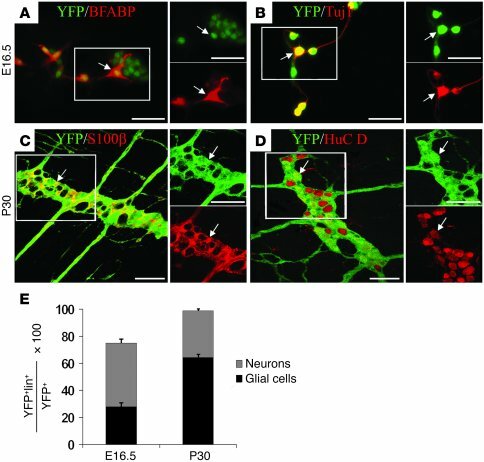 (E) Quantification of the fraction of YFP+ cells that belong to the neuronal of glial lineage of the ENS. Error bars indicate sem. Scale bars: 30 μm (A and B, insets of A and B), 60 μm (C and D, insets of C and D).